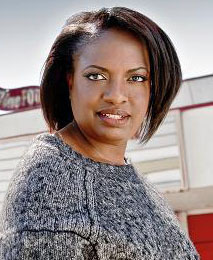 Detective Elouise ‘Lou’ Norton works the homicide beat in South LA. Sometimes investigations pull her down into The Jungle, a neighbourhood once named for the surrounding vegetation, but now known for the drugs and gangs that give it a wild air. Other times her work daws her into the affluent neighbourhoods nestled in the surrounding hills. It is in these hills that she’s called to investigate a house fire. Homemaker, Juliet Chapman and her two children have died in a huge blaze. Juliet’s stockbroker husband, Christopher Chapman, has escaped unscathed thanks to a late-night trip to the office. Did Christopher raze his house to rid himself of a demanding wife and a delinquent son? Or was Juliet so unhappy she took her own life and those of her children too? Why is Christopher’s best friend so defensive and determined to derail the investigation? And who was the suspicious man neighbours saw lurking in the area the evening of the fire? Lou is one of the best detectives the LAPD has – she’s also the only black woman in her department – but with her marriage falling apart, a dead sister to bury and a partner who seems to be angling for more than a working relationship, her distracted attention might be the opening someone needs to get away with murder. As far as I’m concerned crime novels need three things to work. Firstly, authentic-sounding details. Are coroner vans really driven by men in LACCO windbreakers? 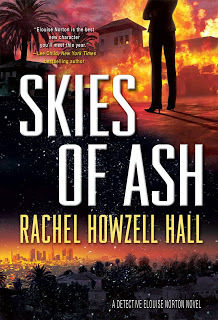 I don’t know, but author Rachel Howzell Hall throws these specifics in like confetti and they add a thick lacquer of plausibility to her writing. Secondly, you need a great mystery. The Chapman fire is as gripping as a marsh bog. With each new witness Lou uncovers clues and details that plough the mystery even deeper until you’re wading hip high in the whos? Hows? And whys? A few pages from the end and I still had no idea who was responsible, but I cared. And that’s the last slice of the triumvirate. The characters. Skies of Ash has lashings of personality and characters who resonate. Hall says she based Detective Lou Norton on Clarice Starling from Silence of the Lambs, she wanted her to be a poised, confident woman with vulnerabilities. That goal is well realised. Lou is the kind of woman you’d trust with your secrets, rely on to have your back, who is respected by her peers, but who can be broken with the right pressure. We first meet Lou in Land of Shadows, book one in the series. She’s just been paired with her new partner and is investigating the death of a teen girl that parallels the disappearance of her own sister. By Skies of Ash some issues have been resolved, others are still in flux. “Each time I caught him in a lie, I hurt. And he apologized. And I accepted his apology. Then he lied again. And I hurt again. We were in syndication by now, with story arcs that wrote themselves.” Lou’s cheating husband isn’t a mystery she can solve and tuck away; her continued loyalty to him baffles everybody who admires her strong personality. But this weakness, her yearning to be loved makes her human and fallible. Her combination of strengths and flaws makes her the perfect character for a series, a heroine you can root for and watch grow. There are a ton of supporting characters in Skies of Ash. Colleagues, family, friends and a new witness every few pages. But Hall manages the multitude brilliantly, mostly because she’s adept at creating distinctive voices: “’I’m on my way out,’ she told me, phone still to her ear. ‘I’m not buying nothing, I don’t need you to paint my curb, and I already know Jesus thankyouverymuch.’” Their vernacular varies according to class and profession and cultural background, it’s a clever act of ventriloquism. I hugely appreciated Hall’s spirited and brisk prose. “There was more life in King Tut’s tomb than Virginia Oliver’s parlour.” She has an economy with language that keeps her writing crisp and the story powering along. In short, I enjoyed this crime story on multiple levels. I didn’t notice until the end how neatly Hall had planted the serial storyline in my head, now I not only want to know how this particular mystery ends but I’m eager to see where Detective Norton will go next. Masterful.